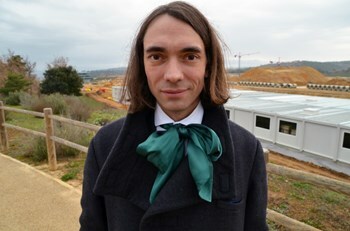 2010 Fields Medal laureate Cédric Villani visited the ITER site on Thursday 20 December before giving a seminar at CEA-Cadarache's IRFM. A professor at the École normale supérieure and the director of the Institut Henri Poincaré, Villani, 39, was awarded the Fields Medal two years ago. The Fields—equivalent in prestige to a Nobel Prize (not awarded for mathematics)—is the highest prize a mathematician can receive. Although not directly connected to fusion research, Villani's work stands "at the extreme theoretical end of ITER," exploring the properties of some of the equations that describe the behaviour of particles in a plasma, or the movement of stars in a galaxy. In the summer of 2010, he taught a course at Marseille's international centre for mathematics meetings (Centre International de Rencontres Mathématiques) as part of a program on mathematical plasma physics related to ITER. Last Thursday 20 December, before giving a seminar on non-linear Landau damping at the CEA Cadarache-based Institute for Magnetic Fusion Research (IRFM), he paid a visit to the ITER site with a party of IRFM physicists. In a previous Newsline interview the Fields Medal laureate had stressed the importance, when one deals with abstractions, of remaining solidly "anchored in reality." The mathematical equations he explores, after all, are the true foundations of the ITER Project.